Burnett/Cash/Lynn; Cash; Cash/Leventhal; Cash/Phillips. Very Good. In very good packaging. 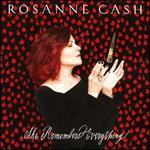 Rosanne Cash-She Remembers Everything by Rosanne Cash. Burnett/Cash/Lynn; Cash; Cash/Leventhal; Cash/Phillips. New. New. 602567891628 We cannot ship expedited. Expedited orders will be auto cancelled. CD.